A collection of occurrences, remembrances and stories of life growing up and living in central, rural, Indiana 1931 -2005. This period covers the Great Depression, schooling, World War II, The Walker family business, Korean War service and several ''thoughts'' that were put on paper while looking out the window.. .abstract sharing bits! Enjoy! John C. Walker, retired in 2005 after serving thirteen years as Executive Director of the Tipton County Foundation. Walker is a native of Tipton, Indiana, attended Tipton schools, graduating from Tipton High School in 1949. He then attended Hanover College until called to service during the Korean conflict as an infantry officer. After discharge from service in late 1953, Walker returned to his family business the Tipton Produce Company. The Walker family also operated the Tipton Meat Market, Tipton Locker Plant and Walker Poultry Farms raising both broilers and laying hens. Tipton Produce was purchased in 1962 by the Hy-Line Chicks Division of Pioneer Hi-Bred Seed Corn Company. Walker worked in the Commercial Egg Processing and Marketing Departments until being transferred to the Seed Division as Sales Communication Manager. He then assumed the role of Sales Training Associate retiring in 1992. Walker is a member of Kemp Methodist Church, the American Legion, Elks Lodge # 1012, Sigma Chi Fraternity and the Tipton County Foundation. $25.00 (hard cover), $20.00 (soft cover) + plus $5.00 shipping and handling. 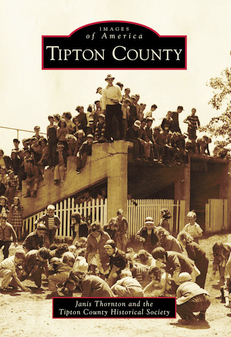 “Images of America: Tipton County,” published in late 2012, features more than 200 vintage photographs depicting Tipton County life from the late 1800s through the present, most contributed by members of the Tipton County community and never before published. The book’s narrative begins with the county’s founding in 1844 and progresses to more recent years, highlighting several of the influential people and pivotal events that shaped the county. On every page, readers with ties to Tipton County will find nostalgic reminders of their shared heritage — the frequent rumblings of steam locomotives passing through, public gatherings on the courthouse square, balloon ascensions, war bond rallies, the awe-inspiring staircase to the Carnegie library’s main floor, live performances at the Martz Theatre, 10 cent-a-week newspapers, baked beans and brain sandwiches, Blue Devil sundaes, pin boys, county basketball tourneys, double features, and packed churches. $21.99 (soft cover) + $5.00 shipping and handling.